The Start button is your entry into Windows Vista. By clicking the Start button, you can open Internet Explorer, see your username, and view your existing network, among other things. 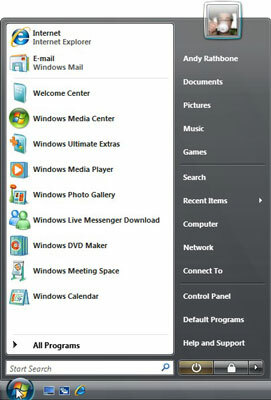 Vista’s Start button menu is shown in the following figure. Internet Explorer: This option lets you visit the Internet. E-Mail: Choose this command to send or receive e-mail with Vista’s new Windows Mail program. Recently Used Programs: The Start menu’s left side constantly updates to list your most frequently used programs’ icons for quick launches. Search box: Conveniently placed directly above the Start button, this area lets you find files by typing a bit of their contents — a few words in an e-mail, a document, or a program’s name, for example. Username: The name of your user account appears at the Start menu’s top-right corner. Click here to see a folder that contains all your files, as well as your Documents, Pictures, and Music folders. Documents: This command quickly opens your Documents folder, making it more imperative than ever to always store your work here. Pictures: Keep your digital pictures in this folder. Each picture’s icon is a tiny thumbnail image of your photo. Music: Store your digital music in here so that Media Player can find and play it more easily. Games: Windows Vista offers several new games, including a decent chess game. Finally! Search: The word Search on the Start menu, removed by Vista’s Service Pack 1, lets you search for files in precise terms — say, all files created in the last two months containing the word oyster. Stick with the easier-to-use Search box, along the Start menu’s bottom. Recent Items: Viewed a file within the past few hours? Chances are, it will appear here for quick access. Computer: This option displays your computer’s storage areas: folders, disk drives, CD drives, digital cameras, and other attached goodies. Network: If your computer connects with other computers through a network, click here to visit them. Connect To: This area lets you connect to different networks. It’s a quick way for laptoppers to connect to a wireless network, for example, as well as a one-click Internet entrance for people with dialup Internet connections. Control Panel: This area lets you adjust your computer’s oodles of confusing settings. Default programs: Click here to control which program steps in when you open a file. Here’s where you tell Windows to let iTunes handle your music instead of Media Player, for example. Sleep/Power: Clicking here either puts your PC to sleep or turns it off. Lock: This command locks your user account, letting other people log on without accessing your files.